During the early morning of December 17, 1896 Adelaide Herrmann suddenly found herself not the co-star of the Herrmann the Great touring show but simply as the widow Herrmann. Her husband, Alexander Herrmann, had reigned supreme as America’s foremost magician for many years and she had lived a life of luxury. Now, just forty-three years of age, Adelaide needed to make a living and magic was all she had known throughout her adult life. Immediately following Alexander’s death she cabled her nephew in France instructing him to sail for America. Leon Herrmann was already an accomplished magician and perhaps even more important, he looked like his uncle with a black mustache and goatee. This new iteration of The Herrmann the Great show toured America for three seasons but a clash of temperaments finally doomed the enterprise. Leon further antagonized his aunt by retaining the title Herrmann the Great, which he used for his own full-evening show. Another nephew, Felix Kretschmann, the son of Adelaide’s sister, decided that he too would become a magician. He purchased enough of Alexander’s magic equipment, costumes, and curtains from Adelaide to produce an act, grew the required goatee and mustache, and then, much to his aunt’s chagrin, legally changed his name to Felix Herrmann. Taking this as an affront to her deceased husband, Adelaide never forgave Felix to the point that she removed his name from her will. 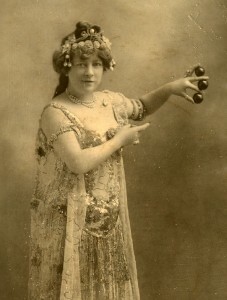 Adelaide carried on as a magician, a domain that was inhabited almost exclusively by men. During her long career she appeared at the Wintergarten in Berlin, the Folies-Bergere in Paris, and the Hippodrome Theatre in London. As a star in American vaudeville her career extended far longer than any other member of the Herrmann dynasty of magicians. She appeared before the public for more than half a century, retiring at age seventy-six. Egyptian Hall Museum is the oldest private magic museum in America, started in 1895 by W.W. Durbin and later nurtured for nearly fifty years by David Price of Brentwood, Tennessee. Mike Caveney and George Daily acquired the museum in 2000 and today Mike curates the collection in Pasadena, California. Mike Caveney is a well known magician, historian, writer and publisher of books on the history and practice of magic. His historical works include biographies on The Great Leon, Servais Le Roy, Harry Kellar and Charles Carter. For Taschen Books he co-wrote a massive tome called MAGIC 1400s–1950, which has been translated into six languages.